This one-of-a-kind necklace features beautiful and unique turquoise jasper stones accented by free-form pyrite nuggets. 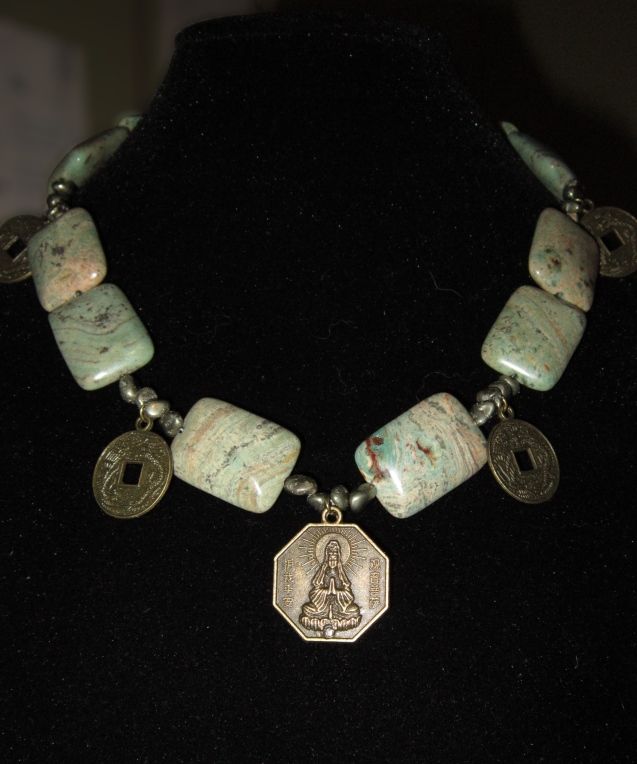 The necklace is reversible as the Guanyin (Kwan Yin) centerpiece and replica Chinese dynasty coins are double-sided. The jasper stones have a warm, wavelike sage green color with deep brown bands and the pyrite, also called Fool's Gold, really brings out the beauty of the jasper and the antique bronze coin pieces. Guanyin is the Bodhisattva of compassion and is believed to observe or hear the cries of the world; on the back of this quarter-sized centerpiece is the yin yang symbol. The dynasty coins, which are penny-sized, bring luck with a dragon on one side and Chinese characters on the other. This distinctive necklace is as stunning as it is bohemian and is sure to bring compliments. It is moderate weight and closes with an adjustable antique bronze toggle clasp that adjusts from 14 3/4" to 16 1/4". The last two pictures show the reverse side of the necklace.